Looking for more? Read more posts about 21 Days to a More Disciplined Life. I chose to respect my money. To me, it means putting my money neatly in my wallet instead of just throwing it my purse. And putting my debit card in the proper place as to save time and alleviate stressful situations. So far so good…. Wow this would be a good one for me I always stick my debit card and other cards in my back pocket and throw the money in my purse as well. Hubby would be so happy if I would work on that one! That is such a great mindset to adopt! I’ve always been really Type A about my money…all my bills have to be in my wallet, in the same direction, etc. etc. But sometimes that doesn’t transfer to respecting it in terms of how I spend it. Thanks for the reminder! I didn’t consciously plan to “join in,” but you must have infiltrated my brain. Anyway, Monday afternoon I realized that there were a lot of things that I avoid because I just don’t want to do them, things like teach 2nd grade math. My one thing has nothing to do with the things I avoid, though, ha! I’m trying to go to bed an hour earlier. I have been wracking my brain with the 20,000 habits I need to change or start since this morning when I read your post from last night and just now when I was reading your new post, the most obvious one jumped out at me. Anger. I desperately need to make not getting angry easily my TOP priority. I am seeing it starting to transform my children and hurt my marriage. I need to stop yelling, tell them once and if they don’t obey, follow through but there is the hard part! CONSISTENCY!! So hard but with God’s help, I can get started on this right away. Thank you Crystal!! I severely need 2 stop being so angry and unsociable… Everything irritates me and I really wish I could find something to do with my free time, especially when I’ve got nothing planned, my son needs friends and I’m in need of entertainment!! I’d suggest to start taking your son to age appropriate activities at your local library. It’s usually free and you can meet other moms. If the weather is nice where you live you can also go to the park. I did these things when I first moved here and it really helped me be less lonely and bored and once I got to know people well, it helped me not to have the time to think about getting anger and unsocial. Also, a lot of prayer went into my day then too. And I started finding ways to give to others mostly with out them knowing. Like mailing a card of encouragement-unsigned or leaving a gift on their front step when I knew they weren’t home. —Ok I didn’t mean to write a book but I just wanted to say I totally understand! *The Heart of Anger* by Lou Priolo has been a great book for me on this topic! wow, me too. I was thinking I should go to bed with a clean kitchen, read the scriptures, or train my children in one habit, but you hit the nail on the head. I need to control my outbursts and then I can tackle all those other things. That is going to be priority number one. I also was a yeller. My mother did it and thought it got things done when my kids saw me angry. It was not unitl I went to at communication class for work and learned Yelling hands away your personal power. At the time my kids were not listening to me unitl I yelled. Sometimes even when I yelled they still did not listen. I have changed that now. As teenagers, I tell they what I want and let them decide if they want to do it. Most days they do it because now they are being treated respectfully and want to show me that same respect. Wow, I need to work on this too. I’m so encouraged to see so many other Moms in the same boat. My 2.5 year old is very difficult right now and it’s wearing on me. The constant tantrums, including calling me “poopy” and kicking me in the head for fun, are starting to get old. I’m sure we’ve all been there. For me being tired and eating poorly contribute to my temper and lack of patience. I was much better for awhile but backslid the past few weeks because I’ve been eating like crap. Thanks for the reminder. This is a good one for me too. I think if I really stop and look at myself, I am too lazy or chicken to follow through with first-time disobedience consequences. I have trained my kids to know that Mommy is not serious until the 20th time and/or she’s yelling. This is so not good. I will make myself stop yelling, period, and then the first-time offense consequences will have to naturally follow. I was already thinking of choosing the same one you chose! Last month I did the “Frumps to Pumps: Get Dressed Challenge!” with Sarah Mae from Like A Warm Cup of Coffee. Now I’m successfully getting up and dressed (rather than spending half the day looking frumpy) but I want to get in the habit of getting up EARLIER. I want some quiet time to read my Bible, read a book, take a shower, etc without the kids (2) around. I’ve seen that you and Amy Lynn Andrews and a lot of other moms of little ones really seem to keep coming back to how important those early morning hours are. When I first became a stay-at-home-mom, I learned the hard way how important it is to shower, get dressed and have a little time to myself in the morning. It’s amazing how much difference it makes in the rest of the day, and is well worth sacrificing a little sleep. About once a week, if I know I’m really going to be working hard in the house and doing a lot of cleaning, I will get dressed in sweatpants and a T-shirt, but other than that I always make sure that I look decent enough that I am not embarassed if somebody stops by. I love, love, love this series! Logged on late tonight just to see what our next challenge is. I am definitely NOT the one to preach on this, but I found I do so much better if I wash my face while I an giving my kids a bath. Not quite as tired at that point of the night. Patti, I agree. I do best if I do those things when my son takes his bath or shower in the evening. I’m right there in the bathroom, and he likes to play for a few minutes anyway. Oh! This is brilliant…perfect time to scrub the face! Thanks for the tip! Wow! What an awesome post. . .and great reminder! This is the same habit I’m working on. I love to cook, but hate the clean up so there is usually a pile of dishes in my sink every night. It discourages me from wanting to cook meals the next day because I know I have to start off with the dishes. Now I’m going to keep up with the dishes as I cook, and not go to sleep with a dirty kitchen! My habit to change for myself is to get up early each morning so that I have time to get my writing done before my husband and son get up and need to get off to work and preschool. It seems like after they leave my morning is just full of going to the market to buy fresh veggies and taking care of laundry and everything else. I desperately need to get more disciplined before our new little one joins us next spring. And for my son, he’s going to learn to go to sleep without Mommy in the room. It’s not gonna be pretty but I’ll end up with about 7 extra hours/week once I stop this nonsense that I’ve allowed. I really need this series. I was doing well for a while, but I’ve really fallen into some bad habits this past week. My husband is out of town and I think I’ve fallen into a bit of a depression. So, I need something to get me out of this and more motivated. My habit that I am going to work on is scripture study every day. I have worked for years to stick to the goal of daily scripture study and I do well for a time, but then I get out of the habit. 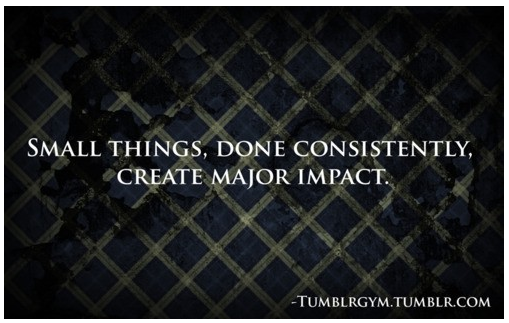 However, doing this one thing (and exercising) has the greatest impact on me. So, I am recommitting myself again. Just wanted to let you know, you aren’t the only one who gets into a bit of a depression when the hubby is out of town. My husband takes a few trips for work each year and those are the worst 4 days ever! It seems like everything goes wrong when he is gone (although it’s just our regular life, I feel like things just happen worse) The kids feel it too. Thanks for the reminder. My husband will be out of town next week again for 4 days and daily scripture may just help easy this depression. Thanks again! I must’ve been looking into the future or something- last week I decided to get my act together and stop leaving dishes all over the kitchen each night. If I leave them one night, I never want to wash them the next day, so they pile up until I’m forced to do them because we’re out of dishes. Ugh! So far, I’ve been doing good. I’ve left a pot or pan here and there, but the sink itself is staying clear! I’ve been more motivated to cook with a clean kitchen! I too a few weeks ago decided to do this! I know how you feel! The start of my day just feels so much better when the kitchen is clean and the house picked up! I’m going to cheat a little and work on two habits at once because the first is SO simple (eating breakfast and lunch at the table with my preschooler: we already have a family dinner every evening after her dad gets home, but when it’s just us I tend to let mealtime routines slide). The other is to really and truly get our finances back in order! They’re not a huge mess, but we do have some recent medical debt to pay off, in addition to saving for the arrival of our next child this March. Later today I’m going to sit down and write out some money-related goals! The first one is to begin the process of switching to an ING checking account (we already use them for savings) because our local bank is beyond horrible. I’m the same way with meal times. Part of it is I’m not so great at getting everyone’s meal on the table at the same time for breakfast and lunch when we’re not necessarily eating the same thing. And if the kitchen wasn’t cleaned the night before I rush around trying to get that done. That’s not always under my power to control but I can still learn to chill out in the morning. I have been trying to go to bed earlier. Although I started this a few days before your discipline challenge. I was inspired by the “Flylady” who I recently discovered. I set my cell phone alarm to go off at 9:30pm which is my reminder that I have 30 minutes to get into bed. This is really working because it stops me from starting anything new or gives me time to finish up something. I have also allowed myself the preference to 2 nights a week to stay up if there is something I need to do while everyone is sleeping. But maybe I should wait until the habit is established before I start giving myself such freedom because I am a little more than a week in and I have already used my 2 days! I’ve found that planning ahead for going to bed early really makes a difference in whether or not I actually get in bed early! If I wait until the last minute, I always go to bed later than I should! I was going to give you a hard time for not going to be earlier last night! 🙂 I was on the computer until just past 10:00 and this entry wasn’t up yet. Thank you so much! I am having such a hard time at this in every area of my life. I ask selfishly for you prayers. With small children and homeschooling I can’t seem to even find the time to make my list and if I do have the time I am so exhausted I can’t even think. After that has gone on for a while then I find myself just lazy and enjoying pleasure far more than discipline. Thanks again and Lord bless! You are so precious! Thank you for the encouragement and advice! I struggle in every area too! The Lord led me to http://www.titus2.com They have a book called Managers of Their Homes. Now I need to implement it and all of Crystal’s awesome encouragement and challenges! What do you do when you feel like your life is a mess and they all need to change right now? I know the best thing is to change one, but they are all so important to me. Jenna, don’t be discouraged. I know how you feel. There are so many things in my life that need to be changed and I get overwhelmed too. Take small steps and hang in there. Make your list and pick a priority. I know that sounds impossible but you can, even if you have to: 1- make the list, 2- pick 10 priorities and then 3- narrow them down to one or two. Do it anyway. There’s no shame in trying and no shame in being only marginally successful. Keep in mind that any improvement IS improvement. I had an “aha” moment recently when I realized that if I only get the bath tub clean in my kid’s bathroom, and not the counter sink, toilet and mirror (which in the past would have signaled failure to me and I would have given up) it’s not the end of the world. AND at least the tub is clean for their bath!!! Hmmm… improvement. I realized I was on to something. Then the next day I got the toilet and sink clean. Always remember that progress is progress. Maybe you could focus on what would benefit your overall life the most. You are in my prayers. Rebecca – So true that any improvement is something! I’ve been struggling to stay on top of housework since I was married over three years ago, and I recently realized (in the past couple of months) that I’d rather have my house mostly clean most of the time than perfectly clean, well, never. I am a recovering perfectionist and also struggle with the all-or-nothing mentality and really just knowing where to start. Will try to get the habit list started sometime soon. The habit I would like to implement is to organize my mail and coupons daily. It always ended up in a pile in my dinning table and I just move everything to one corner so we can have dinner. For more than I clean my kitchen always look like a mess because of this. One thing that has helped me is to deal with mail immediately–and have assigned places for everything that isn’t going in the trash (freebies, magazines, bills, coupons, etc.). My habit goal will be to spend 45 minutes a day doing specific home upkeep-15 minutes each in the kitchen & living room (why are they always dirty?! ), and 10 minutes in the “other” place that needs the most attention that day-whether it be our room, the bathrooms, or the kids rooms. So often I dread picking up, but if I set my timer and just do it, I feel so much better, and I feel like I’ve shown something for what I did that day. As a SAHM this is so important! My daily habit is reading to my children before bed. By the time homework, chores, baths, etc. is done, I’m worn out. However, I really want them to be good readers, so my goal is to read at night on a consistent basis. I’ve already found that I’m really treasuring this time, especially since I work all day and am a single parent. Great post, Crystal. I love that you read so much to your children! you have inspired me to do the same. I have been reading every morning to my 9 month old while i feed her breakfast! I started reading to my first daughter when she was a baby and, even though I’m sure she couldn’t understand much of it when she was little, it instilled in her a love for read-alouds that has yet to taper off. They now *beg* me to read more–even after a long block of reading. It’s our favorite time of the day! Reading with my dad is one of my earliest childhood memories. He would always read to my brother and me out of a children’s bible that we had. Consequently, I cannot ever remember a time when I could not read. Reading to your children is so important. My teens now talk about how we used to read together too. Reading together makes great bonds grow. Goal was to get up when the alarm goes off, NOT hit the snooze button and lay in bed until I am running late every morning. Well Day 1 didn’t go so well. Let’s try it again tomorrow. This post hits home for me. I also look at my life and all my bad habits, and try to change them in one fell swoop. Then I just give up because I’m too overwhelmed to do everything at once. The first habit I’m working on is to pick up the clutter as I go, especially in the living room. I’m horrible about letting clutter accumulate, and that causes stress. My goal for the next week is to get my house organized, room by room. I started with your 24-hour challenge of accomplishing one goal; I put away the kids’ summer clothes that have been hanging out in piles downstairs, waiting to be put away. That felt good! So far so good, I caught myself this morning before a bad word came out. The next goal I need to work on ASAP is not getting so frustrated so easily. I’ve been like that ever since I was a kid. When this series started, I was a bit overwhelmed with which habit to choose and what to do first. Well, after today, I know what my top three are going to be between now and the new year. In January, I’m going to update my list and pick three more. Here are my choices: 1) Get up at 7:00 AM (lately I’ve been pushing the snooze or just turning off the alarm and sleeping another hour. Changing the time back has helped a lot this week). 2) Use my new found time as my quiet time to do my Bible study, prayer time, and journaling. 3) Exercise 30 minutes/day. I know I will have to tackle each one separately, but all three go together to make my day start off on the right foot. Patti, these are the SAME THREE I selected for myself!! And, I agree, they do seem to go hand in hand for the start to a great day! I’m really enjoying your 21 Days to a More Disciplined Life posts. I had begun challenging myself even before I started reading this series, but getting nowhere – I was trying too much at one time. I think this is a much more doable approach. So I started walking this morning for the first time since September. It felt so good! I start by throwing the bulk of the mail out (a lot of it is junk or stuff I don’t need to hang onto). I mark any reminders on the calendar. Special cards/letters go into a box in storage for special cards and letters. Magazines I want to read go in a basket in a shelf in my office. Freebies go straight into a tub I keep samples/freebies in. Bills go on my husband’s dresser (he does all the bill-paying at our house). Coupons/sales fliers go into the coupon tub to be organized when I plan my menu. And that takes care of 99% of the mail! I’m looking forward to making my list. My first goal is to clear the clutter off the kitchen table, island, and the landing of the stairs every night. One day down…. I love to look at it and not see any clutter. Another important thing I did was let my husband know what my goal is. He went to the stairs and put his stuff away, too. My habit is to have the kitchen cleaned up nightly before going to bed that way I am not waking up to a sink full of dishes and a dirty stove from supper the night before. With both of my girls helping this went by super fast and waking up to clear counters a clean stove and empty sink (for I think the first time ever) was pretty awesome. My bad habit I’m working on breaking is not bringing my 8 month old daughter to bed with me. She still doesn’t sleep through the night, and at 2 am I’m so tired I just take her to my bed, nurse her to sleep, and fall back asleep myself. It bothers my husband because he has to be extra careful not to wake or squish her and I wake him up by bringing her in when he has to work early the next day. So my goal is to stick it out… Stay in her room rocking her until she is asleep enough to lay back down in her crib. Chelsea – I still do the *same* thing with my 7 month old daughter! It’s so difficult to stay awake in the middle of the night but I know both my husband and I (and probably my daughter) will sleep better if she’s in her crib. You ladies are the best! So good to see God’s hand working in all of our lives! I completely forgot about this last night and did not complete my habit. I will be intentional tonight. I have got a sign up right now to remind me! Hopefully this helps! My good habit I want to develop is to study my Bible EVERY DAY. I do okay on the weekdays but then forget it on the weekends. I joined Bible Study Fellowship recently and the discipline of studying my Bible has made me JOYFUL!! Yay! I just read today that Jesus sustains all things by his powerful word (Hebrews 1:3), so I want him to sustain me through his word! This is def. encouraging me to take much needed steps that I need to take for positive change in my family. I have been getting up early consistently, but I must discipline myself to resume exercise. Not procrastinating til the night before school is going well! I read one chapter for my Monday class on my break at work today. 1. Get up at 5:30am every day and exercise 30 min. Sundays off, of course. 2. Finish laundry every day, washed, dried, folded, hung up, put away. 3. Clean up the kitchen before bed every night. 1. Get up 15 min. earlier to get ready for school, so 6:15 instead of 6:30. 3. Put away toys/set out school things before going to bed. By the way, my habits list already has over 25 items on it, and it’s continually growing! My little habit success story is to do one load of laundry per evening (about an hour before I go to sleep), hang in on a rack in the living room. It’s dry in the morning and then I put it away during the day. If I do more than one load per day, I get so overwhelmed by the clean dry laundry that sometimes it sits in the basket for long days before I get around to put it away. Thanks SO much for your post. The “getting up early” is a hard project. My husband is deployed and sometimes I stay up till 1-2am talking to him via Skype (11.5 hr time difference). Mornings are HARD, but my 2 and 4yo are awake bright and early. The habit I need to get back into is using my daily chore checklist. I had modified the ones you made available on your website to suit my own home/family, and they were very helpful. I need to print some more up for myself and start using them again. It always feels good to be able to check things off and to stay focussed on the next thing, and I think it carves out time that I had otherwise been wasting.